A large and distinctive shoulder spot may be followed ​by several faint spots. American shad also have sharp saw-like scales or "scutes" along the belly. The lower jaw does not extend further than upper jaw. American shad are a schooling and highly migratory species. Historically, American shad spawned in virtually every accessible river and tributary along the Atlantic coast from the Bay of Fundy, Canada to the St. Johns River, Florida. Blockage on spawning rivers by dams and other impediments, degradation of water quality, and overfishing depleted American shad stocks. Presently, the Susquehanna, Nanticoke, and Patuxent Rivers are the primary systems that support viable American shad stocks in Maryland. At 20-24 inches, American shad are the largest (and considered the most delicious) of all the shads. 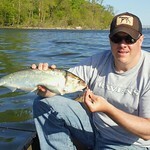 American shad are noticeably larger than hickory shad. American shad are anadromous fish that spend the majority of their life at sea and only enter freshwater in the spring to spawn. Spawning can occur as early as November in southern states and as late as July in New England and Canada. In Maryland, peak spawning time is mid-April through early June, with temperatures ranging from 55-68°F. Peak spawning temperature is 64°F. Depending on their geographical location, American shad may spawn once and die, or they may survive to make several spawning runs per lifetime. This "repeat" spawning in American shad differs according to latitude. Shad that spawn in more northerly rivers may survive to spawn several times; however, most American shad native to rivers south of Cape Fear, North Carolina, die after spawning. In Maryland, repeat spawning adult American shad account for 22-45% of the migrating adults. Spawning American shad females (ages 5 and 6) broadcast a large quantity of eggs (30,000 - 600,000) into the water column over several days; these eggs are fertilized by males (ages 4 and 5). Spawning usually occurs over gently sloping areas with fine gravel or sandy bottoms. After spawning, adult American shad return to the sea and migrate northward to their summer feeding grounds near the Gulf of Maine. Fertilized eggs are carried by river currents and hatch within 7-10 days. Larvae drift with the current until they mature into juveniles which remain in nursery areas, feeding on zooplankton and terrestrial insects. By late fall, most juvenile shad migrate to near-shore coastal wintering areas. Some juvenile American shad will remain in rivers and estuaries up to a year before entering the ocean. Immature American shad will remain in the ocean for three to six years before returning to spawn. Adult and immature American shad overwinter along the mid-Atlantic coast, particularly from Maryland to North Carolina. Maryland’s American shad fisheries have been closed since 1980 (see Maryland's updated regulation page). A catch and release recreational fishery is permitted in Maryland. Beginning in the mid-1990's, the upper Chesapeake Bay stocks of American shad began to increase and a viable catch and release fishery reemerged in the Susquehanna River (particularly below Conowingo Dam). In the last five years, the fish lifts at Conowingo Dam, the first dam on the Susquehanna River, have passed almost 130,000 American shad annually. The popularity of the catch and release fishery below Conowingo Dam has also increased significantly and now you may find yourself shoulder to shoulder with other anglers during the peak of the spawning run, catching up to 100 American shad per day. During an average life span of five years at sea, the American shad may migrate more than 12,000 miles. George Washington was the most prominent American shad fisherman in the region, landing thousands of pounds on the Potomac River. American shad were once highly sought in the Chesapeake Bay, prized for both their roe and flesh. The largest American shad ever recorded was 2 feet, 6 inches in length. The oldest American shad recorded in Maryland was 11 years of age. Alosa is an old name for European shad and sapidissima means "most delicious". For more information on American shad and their management, please contact Genine McClair​.